Above: March 30, 2004 rally. CUPE photo. For most of Connaught’s 100-year history, there was no in-school library to provide students with books and other resources. School libraries were not a major concern in the early school system. It was not until 1964 that the Regina Public School Board hired a professional librarian to begin organizing school libraries, and another two decades after that before elementary schools started hiring their own teacher-librarians. Connaught School, however, had an early advantage in the library department. 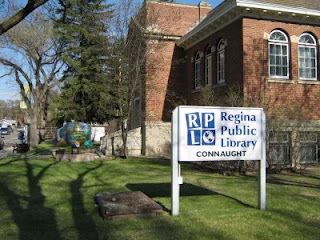 In January 1931, after three years of lobbying by the local residents, the Regina Public Library opened its fourth branch location: Connaught Library, situated on the corner of Elphinstone and 13th Avenue, just across the street from the school that shared its name. The new library would prove to be a source of knowledge and entertainment for Connaught students over the next eighty-some years – and counting. The Connaught branch left Stoner with enough good memories that she returned to work there during her high school and university years, giving her a chance to reconnect with a favourite teacher who often stopped by. Zaren spent a lot of his time haunting the library’s science section, checking out titles like ‘The Boys’ First Book of Radio and Electronics’ and using what he learned to make radios and electromagnets; he grew up to become a science teacher. The connection between school and library did not fade with time. In 1980 – with Connaught slated to become a community school, and its representatives wrestling with education authorities over involvement in the program – the Connaught branch library joined in on the school’s side. Librarian Laureen Marchand became its representative on a coalition of community groups that helped pressure the department of education into concessions, giving the Cathedral community a meaningful role in administering their community school. 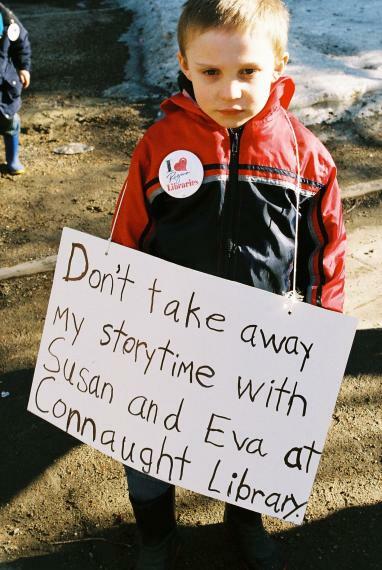 It was a favour that Connaught School was able to repay in February 2004, when student of all ages held a rally against the planned closure of the branch library. That rally, and the larger months-long protest it was part of, convinced the library board to abort the closure – ensuring Connaught library would be there for Connaught students, and all other patrons, for years to come. The library has a lot of memories for me. From the time I first learned to read I remember making weekly trips to exchange the 4 books that a library card would allow you to have. To this day I may have a bookshelf full of books but unless I have a library book in the house I have nothing to read. I belonged to the” poetry club” when I was in Grade 5 at Connaught. Mrs Rands was the Llibrarian at that time and Jan Hone was a librarian assistant or page. I worked as a page at the Library when I was in High school (1971)….. Ron Dutton was the Librarian. Ena Wright was one of the librarian assistants. It was a great time to be there – we designed and painted Mandalas on the side walk at the front of the library. We made puppets, had puppet shows. Ena taught pottery &, macramé. The book shelves had many plants on top – they flourished under the fluorescent lights.the Mural by Lorraine Malach was inspired by Ena and dedicated in her memory. I grew up on Argyle Street, right across from Connaught school, a block away from the library. We moved there when I was 5 in 1975. The library was the hub and centre of life in the neighbourhood. We had just emigrated to Canada from South Africa and it helped us become Canadians. I took pottery classes, attended puppet shows and tagged along to my mom’s macrame, yoga and rug hooking classes. I was even one of he winners of the library kids cooking contest when I was 7. I remember Ena and Jan who worked at the library well. They helped fuel my passion for books as a little kid, teaching me how to navigate the library on my own as a 5 year old. it was very sad when Ena died, she was lovely and young. I remember the beautiful pottery mural that was made to honour her. That mural kind of captures the bohemian and artistic spirit of the library at that time.